a series of transportable Polarimetric and Dual-Frequency, Dual-Polarimetric Doppler Radars. Those ground observations were augmented by airborne ones a NASA ER-2, the research version of the Air Force’s U2 and a Cessna Citation flying in and around storms with an instrument package similar to the one onboard GPM. Fellow Weatherbrain Nate Johnson and I road tripped out to experience the research going on there for ourselves. Our timing couldn’t have been better. We arrived not long before a storm formed on the other side of mount ridge to the west just before GPM overflew. Aircraft were scrambled and we watched as data was gathered simultaneously from ground, mid atmosphere, upper atmosphere and space. Researchers continue to churn on this data and we’ll have better forecast models because of it. While you don’t have a dual-pol radar in your pocket. You probably have a phone that will allow you to join in on a huge ground campaign going on right now. 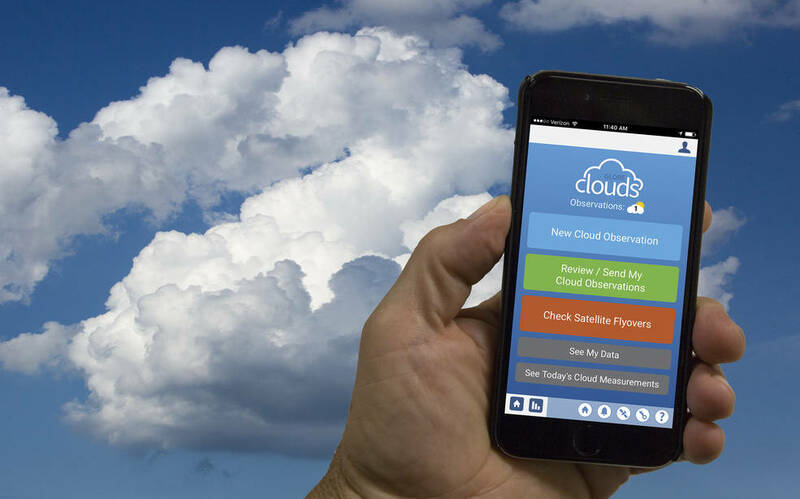 All you need is a smart phone and NASA’s free Globe Observer citizen science app. Download the app, sign in and it will tell you when one of NASA’s convoy of climate observing satellites passes over. Known as the afternoon train, or A-train for short. These satellites pass over the equator each afternoon around 1:30 local. Citizen scientist take photos of the cloud above as these satellites pass over. This view from below is compared to the view from above to better understand the structure of these clouds amongst other things. Participants also take photos at solar noon. You can download the app and see the data at observer.globe.gov.